The British star hit the top spot with the sweet ballad in a number of countries around the world last year (14), as well as making it into the top ten in the United States and Canada. 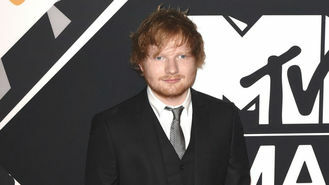 The track has not only proved one of Ed’s most popular, but it helped childhood pal Amy Wadge get back on her feet financially too. Thinking Out Loud eventually went three times platinum in the UK and is one of the most popular songs on Spotify, hitting half a billion streams. While Ed gets to enjoy performing the track for his fans, he’s just as glad Amy and her loved ones are benefiting from it in their own way. Ed made the admission ahead of his hosting duties at the MTV European Music Awards in Milan, Italy on Sunday (25Oct15). As well as presenting the televised show alongside actress Ruby Rose, the 24 year old picked up two awards and put on a rousing performance of Lay It All On Me with Rudimental.